Chester Village needs volunteers. why not join us to help others. Our volunteers are given the opportunity to work in areas they truly enjoy. You can take pleasure in the many wonderful benefits and opportunities that we offer, to work with seniors and give something back to your community, while you get valuable work experience, meet new people and make new friends. 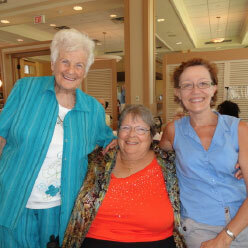 Volunteers play an important, integral role by enriching the lives of our residents in meaningful ways. There are placement positions for all students of all cultures from high schools, colleges and universities. If you are caring and compassionate as well as energetic and enthusiastic, then we want you. You will be working with dedicated, professional co-workers in a meaningful and fulfilling team-oriented atmosphere, with excellent opportunities for personal and professional development and growth. We require a six month commitment, TB test and a Flu shot. A Police check is mandatory for those 18 years and older. Volunteer opportunities include friendly visits, facilitating activities, taking care of pets and plants, clerical support, feeding assistance, working in the Relaxing Café and Village Shoppe, helping with special events and outings, reading to a resident and personal shopping for residents.